Got stink bugs? Please do not just shoo them away or put them out of your house. Kill them! The Asian marmorated stink bug is just really getting a toe-hold (Do bugs have toes?) in New Jersey. In western Maryland where they have been a problem longer, farmers are estimating a 20% crop loss in apple orchards from stink bugs. They can be predacious as well. We saw one that had killed a Monarch caterpillar. I suppose you could keep a few in your house to prevent clothes moths. They also do bite, more like a small pinch. If you don't want the smell around (It's not that bad) take a tissue or piece of paper towel and give them a squeeze. Fly swatters work, too. Let's help keep these pests under control- one bug at a time. DOUGLASSVILLE — Maybe you think the federal stimulus program is wasted money. But what if the spending could help get rid of those invading stink bugs? That's right, the stink bug whose media popularity is only slightly lower than bedbugs is becoming a serious agricultural pest, particularly in orchards and other fruit producing fields. The task of controlling that pest falls to an arm of the U.S. Dept. of Agriculture in Kearneysville, W.Va. called the Agricultural Research Service. And, that Agricultural Research Service facility where stink bugs are being studied is in need of a new air distribution system. Designing that system is a task that fell to Douglassville-based STV Inc., the international engineering firm that began in a Pottstown attic in 1945. The money to pay for the design work came from $34,294 in federal stimulus funding. Thus, in a roundabout way, stimulus dollars are squashing stink bugs. 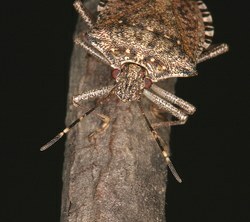 According to information posted on the ARS website, "we've seen incredible population growth (of stink bug population) over the last few years and so in tree fruit orchards, particularly in apple and peach, we've seen the adults entering the orchard early, beginning to feed, causing severe injury." "This year we have seen growers who have had a total loss of their crop from this insect," the site reported in an article about its research. "The damage is found throughout West Virginia and in the surrounding states and the bugs aren't just a threat to fruit," the site reported. "They're damaging corn, sweet peppers, tomatoes, beans, so yes they are more than just a nuisance; they are a serious crop pest as well," ARS researcher Tracy Leskey said in the article. Brown Marmorated Stink Bugs are natives of Asia. According to the Penn State College of Agriculture website, the bugs were first detected in this region in Allentown in 1998. They've since been found in at least 26 states. STV Inc. spokeswoman Debra Trace said the company — which employs 275 people in its Douglassville offices and has branches in New York, Pittsburgh, Philadelphia, Baltimore, Los Angeles, Chicago and Canada — has a standing "task order" with the U.S. Dept. of Agriculture to do a broad range of engineering work as required by the department. Trace said the company has a five-year contract with the USDA and that work like this is regularly part of it. "Projects like this are fairly small," Trace said, "but we're happy to do it. We have a number of engineers on staff here and the biggest thing for us is to continually have work for those engineers." "It's a good thing for us," Trace added. "It keeps us working." She noted, that "without (the stimulus funding), these projects might not have been funded and we might not have work for those engineers." The company also received another stimulus-funded design project that falls under the research category. Less high-profile (and less expensive) than the $4.4 million stimulus grant the University of Delaware received to design the next generation of magnets is the $19,665 contract STV received to design an emergency generator for an insect laboratory at the school. No word was immediately available on whether that laboratory also will be engaged in stink bug research. Or maybe they're going after bed bugs.